If you want to make lasting change in your life, don’t set a resolution, practice Starting Over. I first heard of the phrase “starting over,” used to describe a practice over 5 years ago from the Buddhist meditation teacher and author Phillip Moffit. In his book, “Dancing with Life,” he wrote about a strong message to teach you to dance with both the joy and the pain in your life. He shares the wisdom of the path of self-empowerment, and deeply rooted in this search for a more authentic life is the practice of self-compassion. Without it, we would endure suffering endlessly, as if we were stuck in purgatory. Serious stuff. But, he instead teaches about a gentler way, where we can allow ourselves to find peace and a balanced mind and calm spirit by simply “just starting over.” Again and again. Moment to moment. I was deeply inspired by this phrase, and he instilled a radical attitudinal shift in which I began to seriously examine how my mind was continually stuck in self-criticism, expectations and aimed at unimaginable and quite frankly, unachievable outcomes. How easily I was caught and embroiled in my life. Every time I was reactive in my life, or knocked off of my intended path, “just start over.” I immediately incorporated this into my daily life practice. It is a powerful technique that trains us in self-compassion, gentleness, kindness, and allowing. It is not restrictive but allows us to meet each moment with a freshness that does not pull us into our ceaseless spiral of cognitive vomit, of criticism, shame, fear, imperfection and flaws. It is the practice of training in authentic wisdom, steeped in self-compassion and love. When we set a resolution to change, for instance we want to drop the middle aged 20 pounds, and your goal is to stop being the way that you are….lazy….tired….out of shape. You want to eat right and feel strong through exercise. Usually right after you make the resolution to change your behavior, something happens that throws you off track and you return to the undesired behavior. You are invited to Super Bowl parties, and, once again you are drinking too much, not exercising, eating poorly. All of the old, habitual stories flood your mind, along with self-judgment, discouragement, frustration….this is really self-damaging territory. You try again and again, but you never gain traction and you come to believe that you cannot change and that this is impossible, or that you are just not strong enough, or that you are not enough. You watch other people do it, and then social compare with, “How come I can’t? !” Be cautious here, because in that looking glass they are not perfect either. We are all just perfectly human, which is embodied with limitations and impermanence…..but I’ll save that for another blog post. Often the problem is that you don’t know how to be resolute without also being rigid in your expectations. You haven’t learned how to surf on the waves of the ocean of your life, or of your mind. You haven’t learned how to lean in and then let go. You can however successfully navigate those emotionally charged or intractable parts of yourself that are causing the inner storms in your daily life simply by applying the gentleness practice of starting over. As many times as it takes. Even on the cushion, allowing your self to return to the breath again and again, start over and begin fresh again and again. And each time is an opportunity for brain growth. Strengthening the muscles in the brain, reinforcing neuroplasticity and creating lasting change. This shift in focus is attitudinal. You simply apply and attune yourself to every task or person you care about with 100% effort, but when you can’t, you allow yourself to begin again. This is a humble attitude, but is exactly what is needed for you to sustain your resolution. 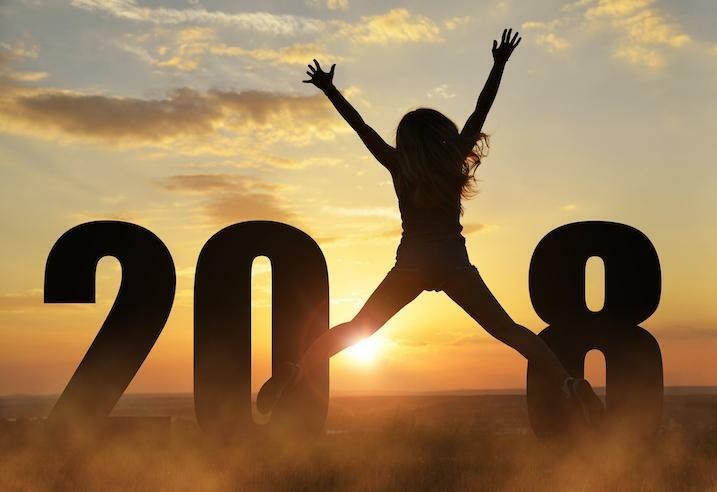 This year, in 2018, free yourself from your judging, self-criticizing, perfecting mind that thinks it can control the results and achieve grandiose expectations that you are capable of impossible things and way more than you can do in the present moment. You will not shoot below par every time you play golf. There are a multitude of conditions that encumber our outcomes. The weather, how much caffeine we have had, how our bad shoulder feels that morning, etc. You become a more effective person simply learning how to use your time and energy to do what you can do right now with 100% effort. And start over unapologetically how every many times you need. When you find yourself getting knocked off balance, don’t judge yourself for getting lost. Observe what happened, how you felt, notice the emotional energy that you waste by judging yourself and indulging in your puritanical mind. It only takes a moment to be compassionate with yourself, let go and begin again. Let your meditation practice be your training ground for this practice. It is a safe environment that allows you to start over, because no one can see that you are starting over. How wonderful! Simply start here by returning to your breath, returning to your intention and within that practice you are cultivating calmness, peacefulness, equanimity, self-compassion and lasting change. Find the spaces for allowing a fresh start. No matter how many times your mind wanders, don’t be interested in quantifying this, instead, be interested in how well you start over.